The day has almost arrived. The day when the “exceptional” nation gets to choose it’s new “commander in chief”. The day when the nation that supposedly defines the idea of democracy chooses between the two most unliked candidates ever put forward in a Presidential campaign. 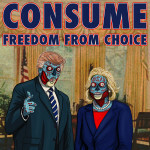 It’s been presented as a simple choice by the mainstream media, the establishment’s anointed queen-in-waiting from the clan Clinton, or the “anti-establishment” rogue from reality TV, Donald Trump. One of the two must be “fired like a dog” by the American people, but which one will it be? Here’s what most people are missing, it doesn’t matter…..
America is being played. Donald Trump isn’t running against the establishment, he’s one of their (two) choices. Presidents and Prime Ministers aren’t elected, they’re selected by the elite powers who run and control countries and economies via central banks and multi-national corporations. You’ll see this, eventually. If the elite establishment were really “running scared” of him as their controlled media is trying to make you beleieve, they would have stopped him. Hillary Diane Rodham Clinton is no stranger to the White House. Or scandal. Her election would bring in to power the most openly corrupt politician in living history. If her previous eight years within the White House haven’t already told you what to expect from a Clinton Presidency, or her stint as Secretary of State, you have the many thousands of leaked emails that have been released by Wikileaks. If you ignore all this, you’ll deserve every piece of ‘bad luck’ that’ll be coming your way. Donald John Trump is a long time friend of the Clintons, and in the past has heaped praise on both of them. Things are different now, or so you’re supposed to think. If as such a friend he’d wanted to help Hillary’s march to the White House, he couldn’t have gone about things any better. His ‘outrageous’ behaviour during the campaign has allowed Clinton to appear “to the left” of the political spectrum, and allowed her friends in the media to focus on him rather than put any kind of spotlight on her or her policies. “Anyone but him” or “I’m with her” should really read “I’m being played”. You could be forgiven for thinking it, if you only took notice of mainstream media, but there are more than two candidates to vote for. You don’t have to vote for either of the two main candidates. This is actually a rare opportunity to start on a path to real, lasting, true change in electoral politics. Rather than prop up a failed system that serves you up the choice of two people you actively hate (hoping you choose the least worst one), it’s time for you to tell the system you want no more of it. Vote for ‘none of the above’, spoil your ballot and send the clearest message that neither candidate carries your support or mandate. Sure, the candidate you hate most will get in this time, but it really doesn’t matter. No one can make America “great” again. It’s problems run too deep already. A debt so huge that it can never pay back, and a world reserve currency (the “petro-dollar”) that is dependent on war and proppped up with guns and arms. America’s problems will only continue to get worse, whoever wins this election. One outcome of this election is sure, the country will be forever divided whoever wins. If Clinton wins, the policies that have created a “Trump” that has gained such wide support will only continue to grow, eventually creating a “Trump 2.0”. And if Trump wins, his victory will start a similar division to what we’ve seen here in the UK with a Brexit victory in the recent EU referendum. Both sides will blame the other for every problem that will inevitably arise. This entry was posted on Sunday, November 6th, 2016 at 1:18 pm	and is filed under News, Politics. You can follow any responses to this entry through the RSS 2.0 feed. You can leave a response, or trackback from your own site.